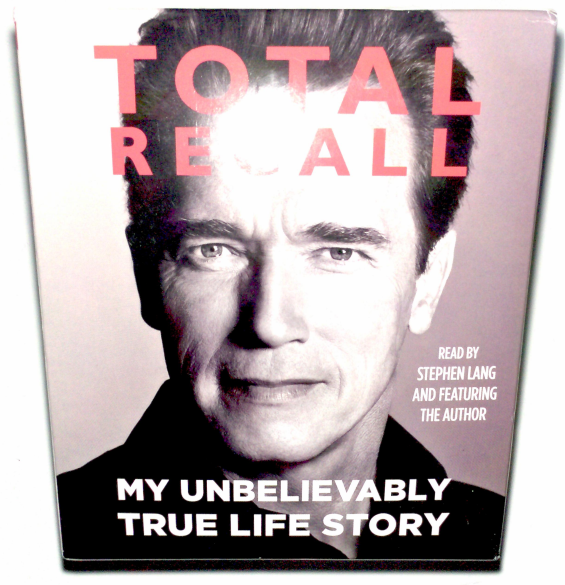 The unabridged, 20 CD audiobook of Total Recall: My Unbelievable True Life Story by Arnold Schwarzenegger. 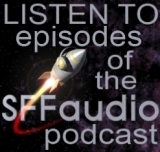 The narration is done by Arnold himself, and Stephen Lang. Lang, besides being a terrific narrator, appeared as the villain of the latest Conan movie – maybe he’s been tasked with reading the evil chapters of Arnold’s autobiography? Maybe. 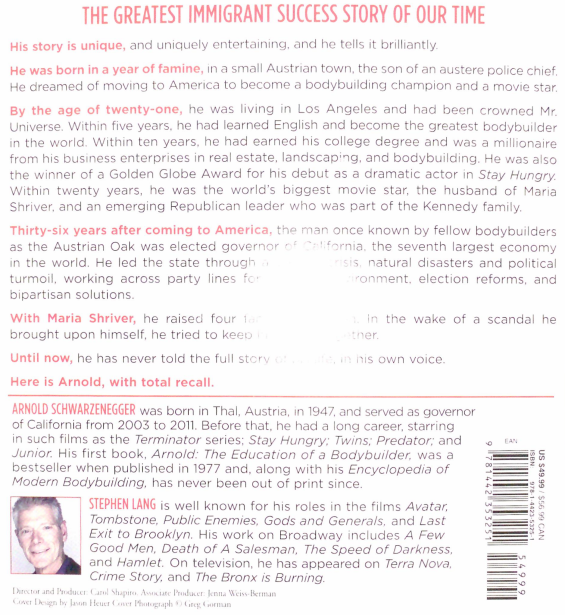 Chapter 1 is read by Schwarzenegger and Chapter 2 is read by Lang. -Hearing about little Arnold in childhood will provide a reminder of his role in Kindergarten Cop, indeed who else could pronounce “poo” as well as the real Arnold? -There’s something of an ideology thrown in here and there in this autobiography, and the remembrances Arnold is sharing, though detailed greatly (as advertized in the title) seem to be clouded by metaphors that can’t quite be literal. Early on Arnold says that both he and his brother thought a local shopping area, in his late 1940s early 1950s country town, was as big as “The Mall Of America” (that’s something that wouldn’t exist for a few decades). 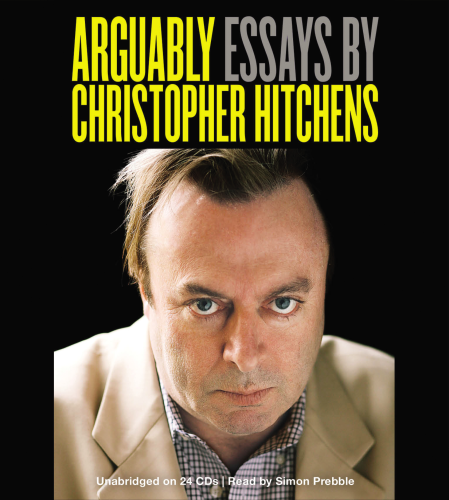 -The many photographs in the hardcover are of course absent, oh well. -The little entrepreneurial Arnold made money by delivering groceries, selling ice-cream cones, and panhandling (grifting actually) with sob stories (he’d tell nice old Austria ladies that he’d lost his all his money so needed money for the bus). Jack London is a 1943 biographical feature film about Jack London! This movie got me thinking. Is it the only biopic of an Science Fiction author? So I looked around and found a list of biographical films on Wikipedia. And while I had remembered there had been movies featuring Mary Shelley, like Gothic – that isn’t a biopics per se. Based on the Wikipedia list, it appears that Edgar Allan Poe has been a character in some quasi-biographical films, notably the recent John Cusak movie, The Raven (which has its roots in earlier dramatized biographical snippets like The Raven (1915)). The Adventures of Mark Twain (1944) is a true biographical film, but it’d be hard to argue that twain wrote Science Fiction (though the case for Fantasy is pretty easy). Robert E. Howard got a biopic, in a solid little movie called The Whole Wide World (1996) but it’s just a snippet of Howard’s life. I don’t think there have been any other Science Fiction writers who’ve had an actual biographical film made about him or her. Maybe writer’s lives are too sedentary for good drama? He prospected for gold, hunted seals and wrote some of the most popular adventure novels of the early 20th Century. But what was Jack London really like? We’ll talk this hour with biographer, historian and novelist James L. Haley whose new book is “Wolf: The Lives Of Jack London” (Basic Books, 2010). In many ways this is a surprising interview – well worth hearing. There are a few facts I’d never heard before and a few fascinating interpretations. The strangest part, at least for me though, were about London’s socialism and the lengths Hayley goes to apologize for it. Very good news, by the way, the audiobook of Wolf: The Lives Of Jack London is available from Blackstone Audio and it’s read by Bronson Pinchot!